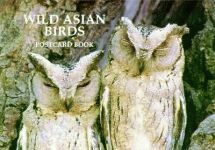 Wild Asian Birds Postcard Book includes the work of some of the world’s top photographers. This is a remarkable and timely tribute to the birds of this seldom-photographed continent. Postcards.